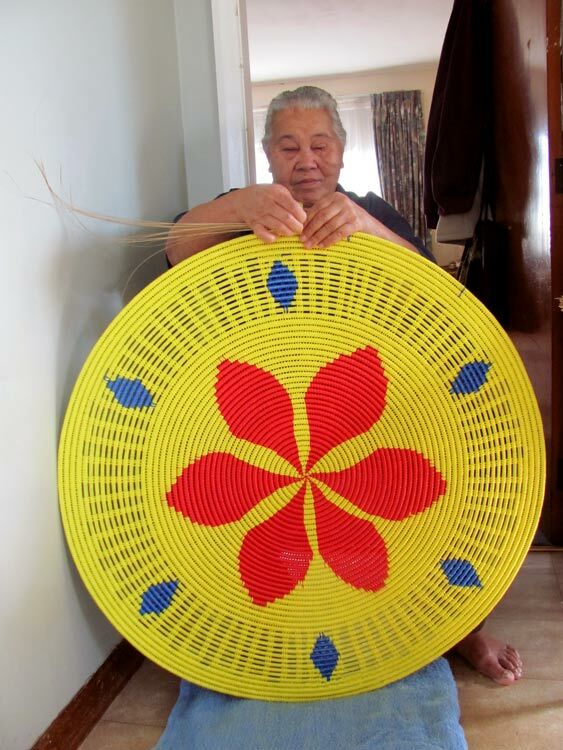 Foufili Halagigie is shown finishing a large lili fakamania (wall hanging) for the Home AKL exhibition in 2012. Halagigie is a member of the award-winning Ōtāhuhu-based Falepipi he Mafola Niuean Handcraft Group; the artwork was commissioned for the exhibition. Falepipi he Mafola started in 1993. With members aged up to 80 sharing their skills, the group has helped develop and maintain the traditional Niuean practices of weaving, plaiting, netting, and carving. Its members also enjoyed speaking Niuean, dancing, singing – they have released a CD of traditional songs – and storytelling.